Shane Marvell‘s career as a rodeo rider is ending far too soon. He doesn’t have a plan B, so during his last season, he’s all in, determined to win as much prize money as possible–even if it means riding injured and taking more risks than he should. Ella Etxeberri has always played it safe, so when her life still takes a bad turn despite her caution, she wonders if if isn’t time to see what she’s been missing. 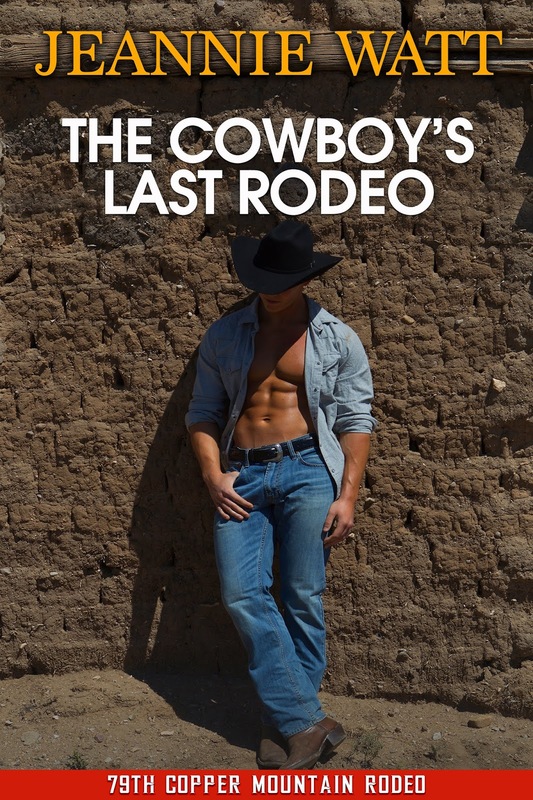 While researching risk behaviors in rodeo riders, she meets Shane Marvell, a cowboy who merits additional study of the personal variety. 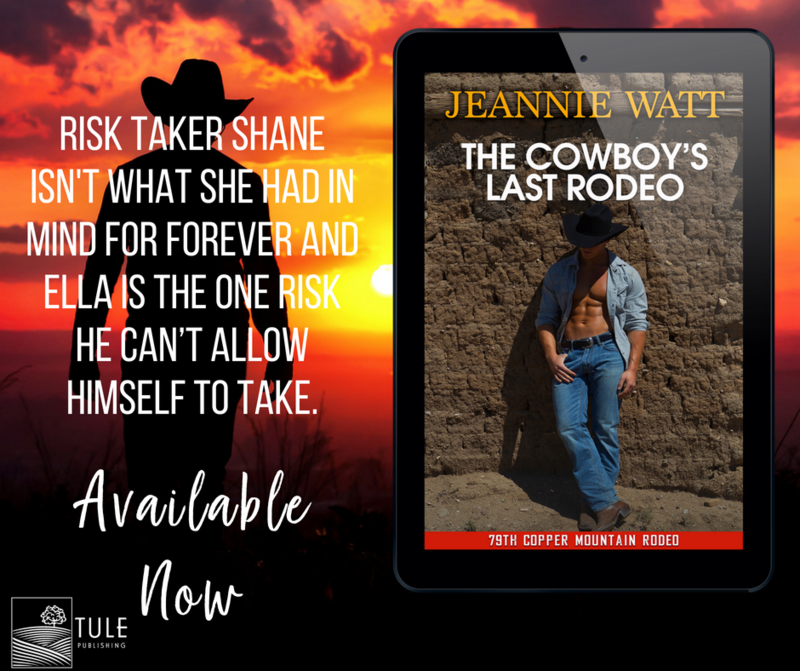 Just as Ella is hitting the point to embrace risk, Shane is pulling back. He knows Ella’s all-in approach is born of curiosity and whim. He’s not what she wants forever, and perhaps Ella is one risk he can’t allow himself to take. He stepped back to allow her to enter first, then followed her in, grimacing as his knee did its best not to cooperate. He set his rigging and his chaps on top of his gear bag next to the small kitchenette unit, then reached behind him for the door handle. Shane shrugged out of his protective vest, tossed it on top of the rest of his gear and unsnapped his shirt. Ella swallowed again, making him wonder if she’d spent much time with guys in intimate situations. Or if it was a matter of her being nervous around him. She ran an exploratory hand over the thick layers of white athletic tape covering the area from his bicep to the middle of his forearm. Then she made the mistake of glancing up. tongue into her mouth, teased it with her own. Jeannie Watt is the author of over 20 contemporary romances and the recipient of the Holt Medallion Award of Merit. She lives in a small ranching community—a place where kids really do grow up to be cowboys—with her husband, dog, cat, horses and ponies. When she’s not writing, Jeannie enjoys sewing retro fashions, running, and buying lots and lots of hay. If you’d like to know more about Jeannie, check out her website JeannieWatt.com or visit her Facebook page www.facebook.com/jeannie.watt.1. 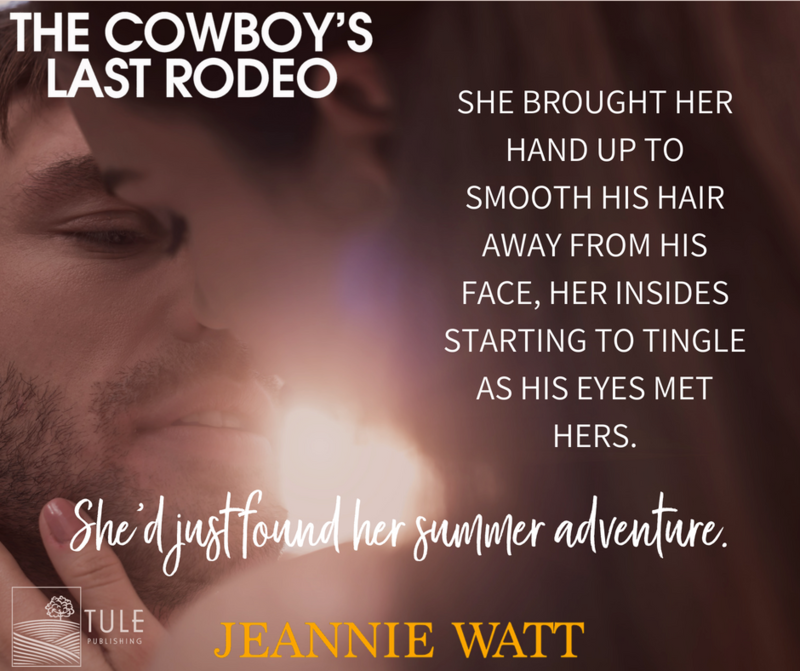 Posted on 13/09/2018, in Authors & Books, Blitz, Blurb, Buy Links, Excerpt, Giveaway, New Releases, Teaser and tagged @givemebooksblog, @JeannieWatt. Bookmark the permalink. Leave a comment.